Citrusey (? ), Tangy, Tasty - a colorful, flavorful blend to wake up your senses! Salsa. 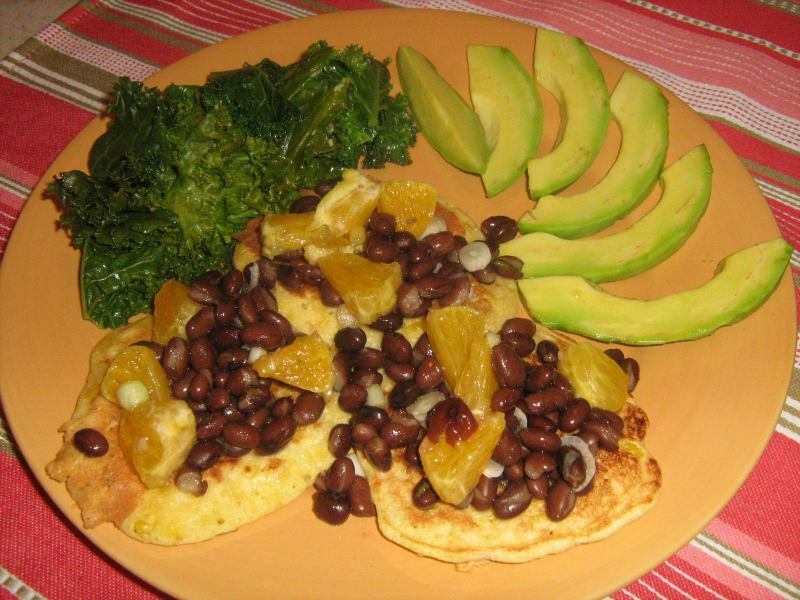 Black Bean and Orange Salsa. Wait, what? Is that the latest dance craze? After all, Salsa is a dance form with origins from the Cuban Son (circa 1920s) and Afro-Cuban dance (specifically Afro-Cuban Rumba (dance)), right? Of course - that's a wiki-definition. But surprisingly, it is difficult to find a definition of "salsa" that does not refer to the Latin dance. That is probably because it literally means "sauce". And we all know how "saucey" Salsa, the dance, can be! Hot! Hot! Hot! But salsa, the "sauce", doesn't have to be hot. It can be mild or it can be an inferno! It is usually up to you if you are making your own. There are many great salsa recipes to be found. And quite often, how hot you like it, simply depends what you are serving with it. 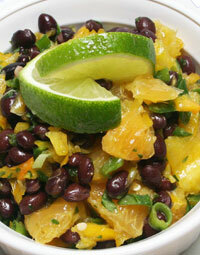 This black bean and orange salsa is reasonably mild. And it is also very delicious! We found it to be a terrific way to dress up corn fritters or corn cakes. So we thought we'd also include the corn cake recipe under the salsa recipe - you know, in case you want to jump right in and give it a try. This version of black bean and orange salsa can also be made with more heat than less - just double up on the jalapeños! Grate 1 teaspoon of zest from orange, and set aside. Peel and section orange, holding it over a medium bowl to reserve juice. Chop sections and place them, with all juice collected into bowl. Add beans, yellow pepper, jalapeño, cilantro and scallions. Whisk together lime juice and oil in small bowl. Mix it into salsa, tossing with fork to combine. Season to taste with salt and pepper. Mix in orange zest. Let salsa stand 30 minutes before serving to allow flavors to develop and meld. This salsa keeps for 24 hours, tightly covered, in refrigerator. Per serving: 65 calories, 1 g. total fat (0 g. saturated fat), 11 g. carbohydrate, 3 g. protein, 4 g. dietary fiber, 166 mg. sodium. In a medium bowl, combine the eggs and soy milk and beat well. moistened and the large lumps are gone. Heat a non-stick griddle or large skillet to medium high heat (~375°). Lightly grease the griddle or skillet. to form a roughly 4 inch "cake". 10 to 12 corn cakes. Top with the salsa and serve.